And now for the big one. 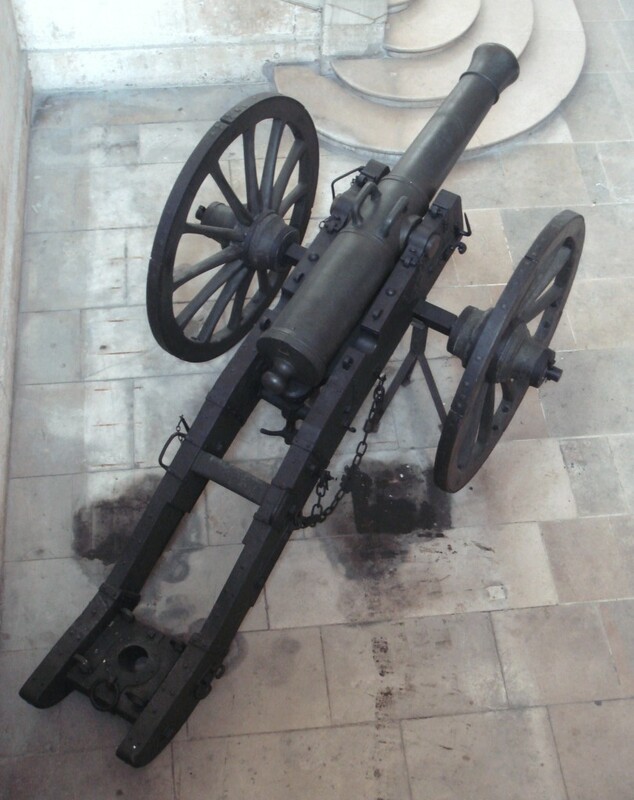 The 12pdr was the standard reserve artillery piece in the French army. These weren’t used in great numbers but they might described as “charismatic”. 12pdr batteries were present at army corps level, and the Imperial Guard had a number of batteries, the elite of the French artillery. The best known version was the Gribeauval one. The picture above is from Les Invilades, the French army museum in Paris, and dates from about 1794, apparently (that may just be the barrel, though). It’s a big brute. Funnily enough the carriage dimensions aren’t that different from the 8pdr (though beware a misconverted metric measurement for cheek length in the dimensions given in RC – the Osprey). The wheels are the same diameter (146cm) and the axle the same length (209cm). The cheek length is 302cm compared to 286cm, and the cheeks are thicker. The overall appearance of the carriage is beefier than for the 8pdr. And the barrel is much bigger of course (211cm from muzzle to base ring, as opposed to 184cm – more misconversions in RC, incidentally): 880Kg, as opposed to 580Kg. Incidentally DDS suggests that the 12pdr barrel was 985Kg in weight, but the two 1794 examples in the Royal Armouries are slightly under 880Kg, the weight given in RC. Incidentally this shows the trail handles, which were not part of the original An XI design. 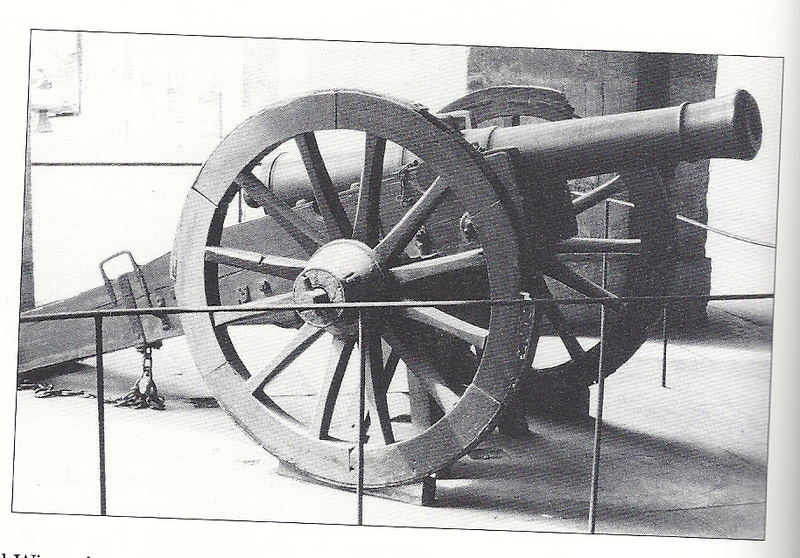 The barrel on this weapon, however, is not the An XI 12pdr (you can see the reinforcing rings in the centre) – it looks like the Gribeauval version. Were many of these newer designs ever made? It’s hard to tell. According the DDS the An XI system was suspended in 1805, and by 1808 the original Gribeauval designs were reverted to, subject to some modifications. Old pieces were converted. 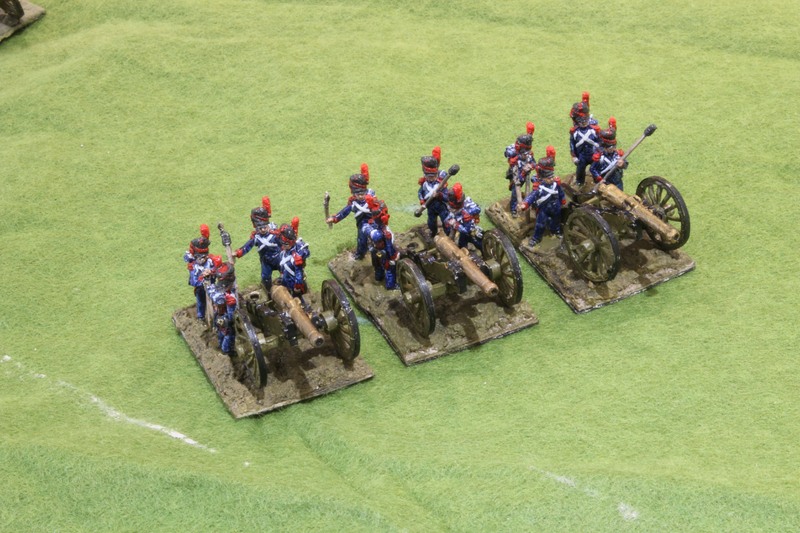 DDS says that all the An XI 12pdr carriages had been replaced by 1812. In which case for one to have survived is quite remarkable. Alternatively it might be that “replacement” did not involve much more than adding the trail handles (visible in the picture above) and other accoutrements required for the old system for manhandling the guns, and recesses for stowing the ammunition coffret on the trail in transit. If so quite a few modified An XI carriages might well have survived until the disaster of 1812. What did the post-An XI 12pdrs look like? These are referred to as “M1808” by DDS, but I think this system of classification (Original An XI = M1803, etc.) suggests more system and uniformity than there really was, as well as being a modern artefact. DDS carries a couple of pictures of later carriages. One is one of the Royal Armouries pieces, thought to have been captured at Waterloo; the other dates from 1821 and is at Les Invilades. The former has a distinctly turned up trail end, but otherwise looks very similar to the 1794 picture above. The 1821 one is not a complete picture – the trail ends are not shown – and I can’t even be certain it is different from the “1794” one in the first picture above. It may well be my imagination, but I think that both of these later carriages look a bit lighter than the older one, though. I’m sure none of the original Gribeauval pieces were withdrawn after 1803. Many tubes from the 1790s or even earlier still survive. DDS count just 20 French made 12pdrs in service in 1807, so it would seem that the army had quite a reserve of old barrels, unused perhaps because of the shortage of horses. A number of An XI pieces were made and then subject to relatively minor modifications. Then a number of post An XI pieces were made, often remounting old tubes. Amongst the 58 captured French 12 pdrs brought to Moscow on the Tsar’s orders in 1813, the tube manufacture dates are 1767 to 1811, with only 15 post 1803. No doubt further tubes were cast in 1813 – but none has popped up in any of the publications that I have read. In fact no tubes later than the 1790s have – which makes judging the appearance of later castings difficult to judge. Now for my models. I already had two AB 12pdr models. While being generally unenthusiastic about them, I haven’t rejected them. What I don’t like is the trail, which has quite a small gap between the cheeks and there is no splay. But from most angles they are quite reminiscent of the Royal Armouries Waterloo piece, without the turn-up at the trail end. 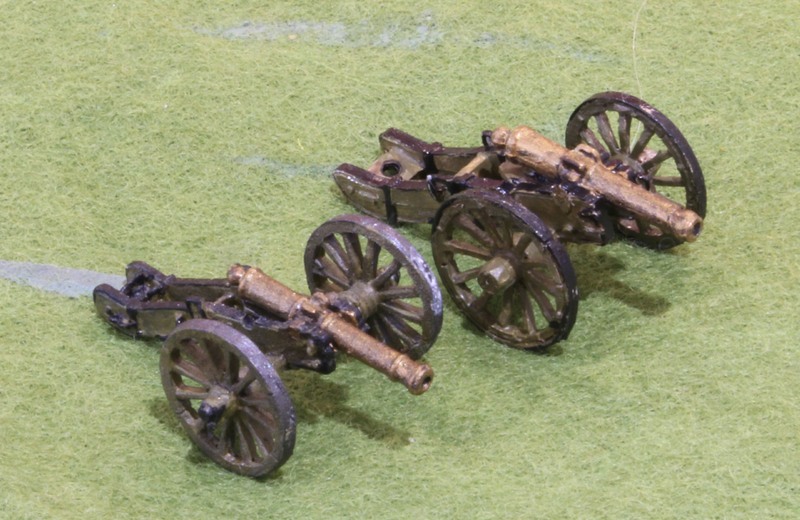 One good feature of the AB models – which Battle Honours (also by Anthony Barton) also reflects – is that the elevating plate is in the right place, rather than being way below the barrel, which Blue Moon tends to get wrong. I wanted at least three more pieces though. I was put off BM by LittleArmies‘ review of their 12 pdr. The trail was 36mm long – 5/6mm too big, though it did have a nice uptick at the end, signifying a late war carriage. But then I had a look at the BM French howitzer carriage. This is way too big for the howitzer itself – my biggest disappointment with Blue Moon, and of which more later. But the carriage and wheels work as the basis for a 12pdr. It is a tad overscale, but tolerable – and better over than under for this piece. The carriage required a few modifications. The rear trunnion recesses had to be cut and filed out. The rear of the elevating mechanism had to be cut out, and an elevating plate (plastic card) put in. A transom (also plastic card) had to be added in between the trail cheeks. The barrels were supplied from stock (I think from old Series 2 Minifigs), though the trunnion slots were a bit deep and I filled them with a little plasticine. In the end I had something quite pleasing, which I think looks the part next to my other models, rather better than my AB piece. So how would I recommend readers get their own 12pdrs without going through the conversion palaver? Well I have said that the AB version is perfectly acceptable, and you can buy them singly at £2.40 each. My worry is that they do not look at their best next to Blue Moon 6pdrs, with their heavier and wider trails – and the BM 6pdr is nicer than the AB version (more of that later). The BM 12pdr might be worth trying if you don’t mind finding £12 for 6. The carriage is too long, but the other dimensions look OK. Better too big than too small for this one. You will not find anything suitable in Old Glory, Fantasin/Warmodelling or Battle Honours. 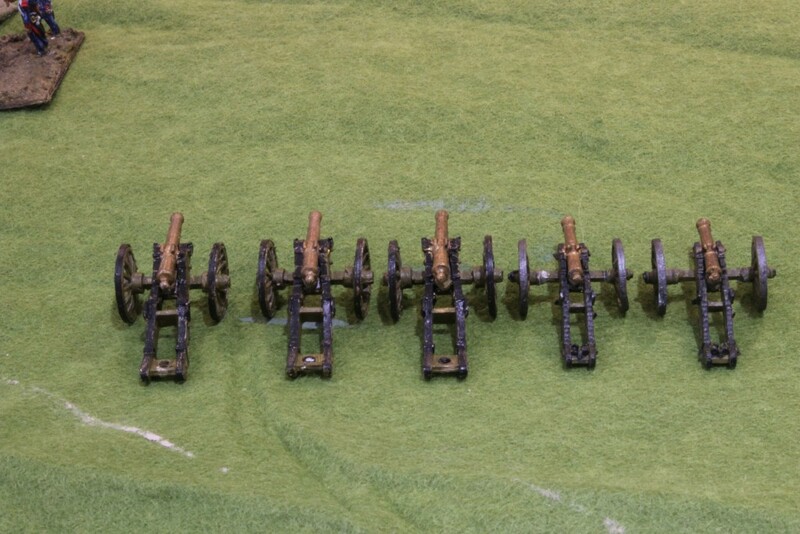 All of these try putting a 12pdr tubes on an 8pdr carriage (though in the Warmodelling case, this isn’t too bad size-wise, it’s just rather vaguely modelled). As this is quite a widespread practice, buying this one on spec is not advisable. You might even attempt my conversion using the BM howitzer parts – but you will need to find some 12pdr barrels from somewhere. And if you want to do the An XI 12pdr? You can get the barrel by filing down the central reinforcing rings from the Gribeauval version, but the carriage looks a tall order. The BM 12 pdr is the closest, though too long. Converting it would be hard work though. For me this is the one that got away – I would have liked one of these in my collection!